Kelli Fox was drawn to astrology during her childhood in Sydney, Australia. As early as eight years of age, she began recording birth dates and sun signs for anyone willing to share. Kelli's formal astrological studies began at the College of Humanistic Astrology. This led to her professional accreditations in Australia and the USA. 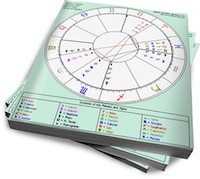 In 1995 Kelli Fox created astrology.com where she continued to live her passion until 2003. A couple of years later, after a near death experience, she launched www.TheAstrologer.com.